How badly do you want to get rich? Not just rich, but filthy rich? Read “How to Get Filthy Rich in Rising Asia,” by Mosin Hamid. You will not only find out how to get filthy rich, you will be entertained for the duration of the 12-chaptered self-help novel. Being rich is one thing, but you need good health to enjoy your new wealth. Here’s the perfect, easy meal that tastes wonderful, is filling and teeming with nutritious ingredients. 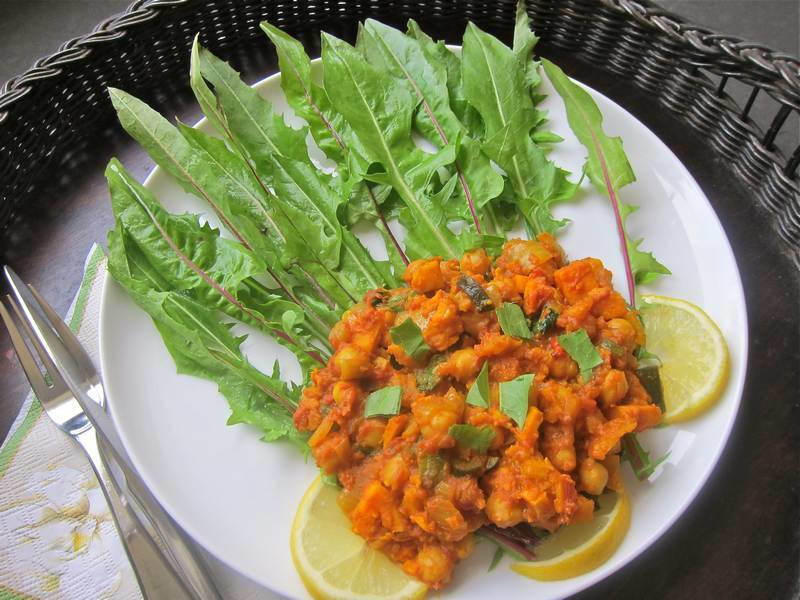 Lay the Spicy Chickpeas on a bed of dandelion greens for an elegant presentation, then cut the greens bite-sized and mix them into the chickpea stew. Heat the olive oil in a large frying pan. Sauté the onion, garlic and zucchini for 5 minutes or until onions soften. Add ginger, cumin, turmeric, coriander and chili and sauté for a minute. Add diced sweet potato, chickpeas and tomato sauce and bring to a boil. Lower heat to simmer and cook 20 minutes or until sweet potato is cooked. Mix in lemon, salt and pepper. Serve on a bed of dandelion greens and garnish with coriander. Serve hot or warm. Serves 4-6.
Credit to Helen Lewis for finding and raving about this spicy chickpea vegetarian recipe from “Lunch Box,” by Marie Breton and Isabelle Emond. I had it for dinner last night, lunch today, and can you guess what? I’m hoping to eat it again for dinner tonight. You can’t mess this recipe up. Helen’s made it several times minus various ingredients, and it always tastes great. Ecollegey is a good place to find all kinds of good organic healthy foods, including these dandelion greens. FYI Frances Moore-Lappé apologized for creating the myth that you have to combine plants to get complete protein in her bestselling 1971 book, “Diet for a Small Planet.” So feel free to ignore the rice and bean combo outdated recommendations. The Leaf Lady spells out the health benefits in dandelion greens. Try a simple salad of dandelion greens and lettuce dressed with a splash of olive oil, rice wine vinegar, Maldon sea salt and freshly ground black pepper. Even the stems tasted fine. If you don’t already follow Saide and Dasie, then you should at least take a look at these gorgeous popsicles. 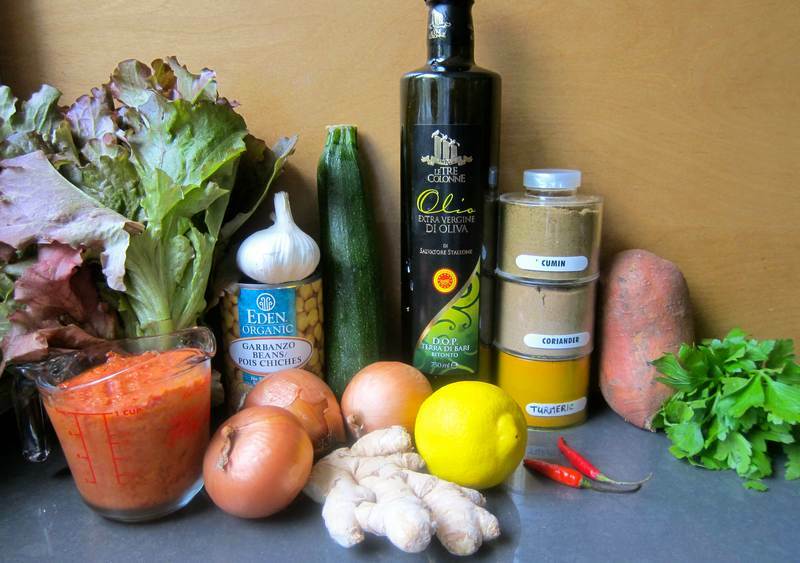 Do you love raw and organic? Are you tempted by wheat grass, chlorella, spirulina and goji berries? Send in your favourite recipes to [email protected] before the draw on October 18, 2013. Thanks to Earth Circle Organics for this generous, $75 value, 6 product gift pack! « Roasted Tomato and Mini Bella Farfalline – Mangia, Mangia! This reminds me of a dish my grandparents used to make but without the sweet potato and Asian spices – Italian instead. There are so many good variations. And I want to try them all! If you try this one you won’t be disappointed. I am sure i won’t. I’m not in need of any self-help books at the moment, unless they’re related to cooking. But this novel style self-help book is fun, touching and a good quick summer read. I seem to be addicted to spicy chickpeas too. Healthy recipe! Thanks for sharing it.